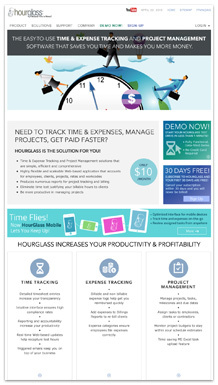 HourGlass is the highly flexible and scalable web-based time tracking and project management application that helps you run your business and provides the accuracy and transparency your clients will appreciate. As a company that bills on a time and materials basis, HTC realized the need for affordable and easy-to-use software to improve productivity and increase profitability by simplifying time and project management. The HourGlass name and corporate identity communicate the “crystal clarity” that this unique software brings our clients and our customers. The implementation of this innovative platform requires a simple, user-oriented design that presents complex information with optimal page loads, easy-to-use interface, and intuitive site navigation. HTC has optimized the information architecture to adapt easily to all corporate hierarchies and company structures. Administrator Manager, Content Status Manager, Media Centre, EasyText Editor, FAQ Manager, Mailing List Manager, Customer Manager, Employee Manager, Transactions Manager, Support Manager, Sales Rep Manager, Site Statistics and Search Tools. HTC developed Customer Manager and Employee Manager to gather and process the large volume of HourGlass user data passing through the site. Security was the utmost priority in developing these modules, to ensure the full protection of sensitive information, both across internal company hierarchy and the online community. HTC has been using HourGlass since 2001 to generate all reports, update all timesheets and invoice every one of our clients. The platform has developed a dedicated following for one simple reason, HTC relies on it as much as other HourGlass users to securely monitor and process every company task. We have experienced the HourGlass advantage and we continue to improve and update the platform to meet the growing demands of our user base. 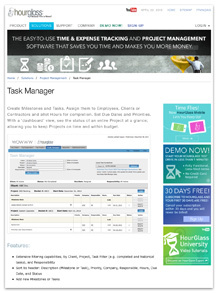 For more information about the Hourglass time tracking and project management system, go to www.hourglass.ca.